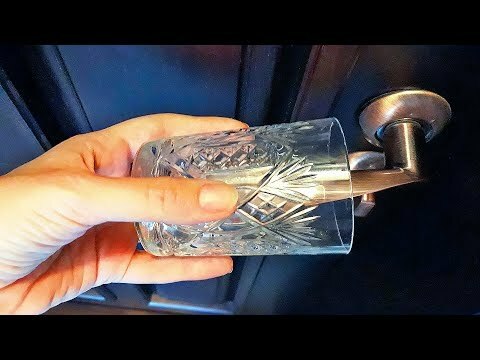 – Slip a drinking glass onto the door handle of your hotel room, on your side. That way, if someone turns the knob as you’re sleeping, the glass will fall and alert you that someone has opened the door. – Use a second wallet in addition to your regular one as a “dummy wallet.” You can even fill it with fake cash or plastic cards so that it looks legit. If you get pickpocketed or, even worse, mugged in the street, the perp won’t make off with your real wallet. – In the hustle and bustle of travel, it’s pretty easy to lose important documents like your license or passport, especially when you’re taking them in and out of your bag to show authorities. If you’re worried about losing these precious documents, scan them and email the copies to yourself. – Choosing a room between the 2nd and 4th floors puts you at less risk of being robbed. That’s because thieves typically hit the first or ground floor since it’s easier to get away fast. – Even if you’re not around, leaving the “Do Not Disturb” sign on the door makes staff and potential thieves think that you’re in there. If you want to take things a step further, turn your TV on at a low volume and leave it on when you head out. – There have actually been cases of people being spied on and even filmed through these peepholes! This is a total violation of privacy! So by taping some paper over the peephole of your hotel room door, you can really protect yourself. – Hotel safes are a great way to keep your jewelry, money, and important documents secure, right? Believe it or not, they’re actually the first things thieves go for when robbing a room. – When you’re traveling, you’ll stumble upon a number of cafes, bookshops, and restaurants with open Wi-Fi. While this is super convenient, it’s also super unsafe. – When getting into a cab while traveling, don’t ever say that you’re a tourist. This immediately makes you a target! The driver may assume you don’t know anything about your surroundings and take advantage of you, like driving longer to hike up your fare. Have you ever used a dummy wallet? Life hack. There is a thing called lock. Tip number 3. Be totally afraid of everything and everyone, for no real reason, even when nothing bad has never happened to you. When getting in a taxi make a note of the milage at the beginning and end of the journey. Some hotel always ask to return the key to the reception spread out in the reception counter so every one coming in the hotel knows what room is empty. Throw squeaking toys all over the floor even bath room .dont want them to dirty up the batroom. and if you email that info it will be out there for everyone to see forever. READ AND STUDY TORAH(NOT KABBALAH), THAT IS THE BEST. What about sleeping on the floor next to the window so anyone comes in see the bed he will think you are not there. That glass tip works only with a particular kind of door handle. Also, most hotel rooms are carpeted, so a glass falling on a carpeted floor will make little noise, and is unlikely to break. Use a flat pouch under your shirt instead of a wallet or purse. Store credit cards and cash in it. This will help you know your items won't get stolen.